Happy cake week! 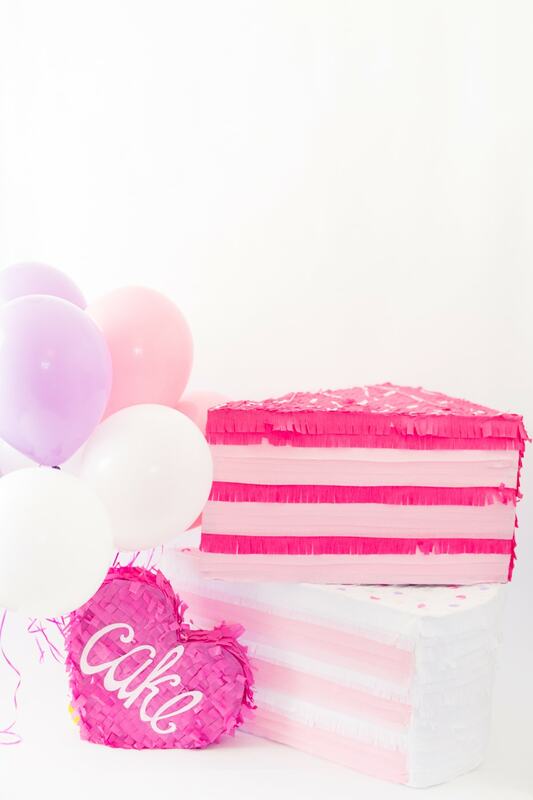 Some of the best parties I can remember consisted of cake (lots of it), confetti, and a piñata, of course! ;) Isn’t that what parties are made for?!? 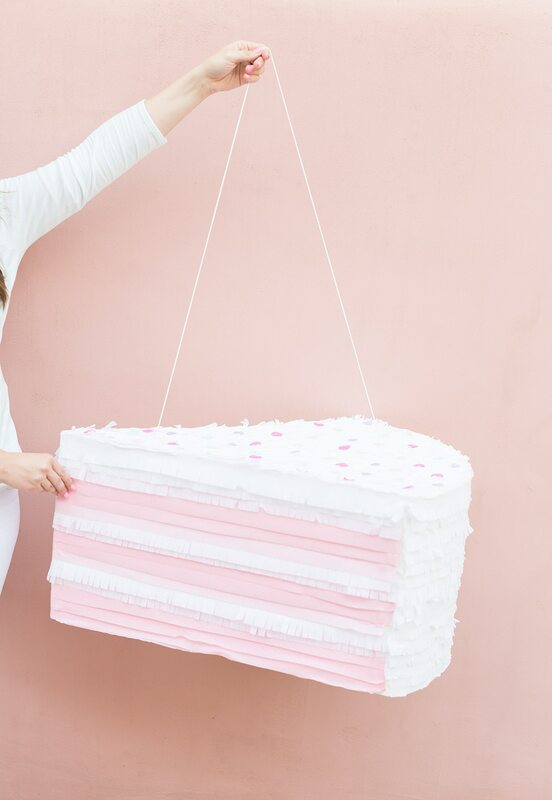 With the whole piñata craze hitting the internet hard (no pun intended), the idea of creating a pastel cake slice piñata made me over the moon excited! I know you guys might be feeling a hair tired of seeing so many DIY projects with just hot pink, light pink, and white, so I stepped out of my comfort zone and threw some new colors into the mix. Do you have a favorite comfy sweater or a favorite pair of shoes that you always feel is a safe bet? Here’s the truth: that is how I always feel when using the color pink. True story! I can think of concepts so much easier when I see it in pink versus other colors. But I realize, not everyone is as crazy excited about pink as I am. Although it’s my favorite comfort, I think that if everything was pink, I too would get tired of it real quick! ;) So I busted out a couple new colors and ran with them! I plan to slowly but surely incorporate more colors into future projects. So, here goes! Tell me what you think! Take one foam board and find the center of the bottom on the vertical ends. This will become your point. Draw out a triangle shape with a rounded top to create your cake slice shape. Using a box cutter, cut out your cake slice shape. Trace another one onto the second piece of foam board and cut it out. On the top piece, poke 2 holes on both sides along the center to support weight. This is also where you will fill your pinata with candy, so cut an opening on the center top area. Measure two 20-inch tall rectangles of the foam board and cut long ways on each piece to create the cake slice sides. For the rounded side, cut a 20-inch-tall piece of the flimsy board. Starting with the top piece, tape together the sides and rounded side. Be sure to use a good amount of tape to support the weight of the candy. Using clear packaging tape makes the surface light and easy to cover in tissue paper. Dark tape can take several layers of tissue paper to hide. Tape on the bottom piece to finish off the cake slice shape. I used streamers to cover the pinata versus tissue paper because it was easier to cover the large shape. Starting at the bottom and working my way up, I glued streamers from one side to the other, gradually adding in fringed icing layers (2 in the cake slice). I then covered the top starting at the rounded side edge and working to the tip with fringed streamers. Next I covered the rounded edge with fringed tissue paper, starting from the bottom and working my way up. Finish off your project by adding some confetti sprinkles in a variety of colors with glue. Fill up your cake slice and party with it! What party are you going to make this for? OMG, that’s awesome! I’m definitely going to try to make it for my mum’s B-Day this month.